Soaking in a hot spring and stargazing on a winter night certainly meets the definition of sublime. When the hot spring is reached after a delightful five-mile hike and you have it all to yourself, the charm of the experience increases exponentially. 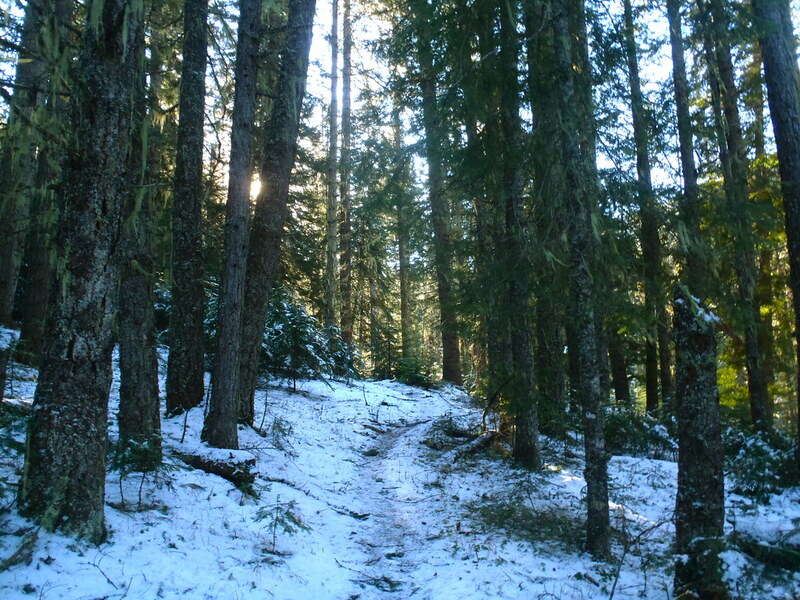 When there’s just enough snow on the ground to provide a lovely contrast to the lush evergreen forest without causing the slightest inconvenience to camping or hiking, then the setting and experience approaches perfection. It should go without saying that finding myself in such a blissful place on Thanksgiving that I was indeed grateful, peaceful, and content in the utmost. Being an only child of divorced parents and having lived a few hours away for a decade, and a day’s drive from extended family since birth, I’ve allowed myself a certain amount of flexibility and indulgence — perhaps even selfishness — around the holidays, for better or worse. For most of my adult life I’ve spent the Thanksgiving holiday with either girlfriends and their families or out backpacking. In each circumstance I’ve created some cherished memories. Thanksgiving with my friend John in the Joyce Kilmer-Slickrock Wilderness of southern Appalachia, tents pitched amidst old-growth poplar trees and a glorious Black Friday climb to the Hangover and its magnificent vista. Thanksgiving spent gorging on gourmet food and bourbon with a girlfriend and her family in the heart of Kentucky’s Bluegrass region — followed the next day by the two of us heading out on one of the most rugged overnight trips I ever did in the Red River Gorge, working off the turkey and camping at an obscure waterfall. So, I suppose on this most recent Thanksgiving sojourn I was merely continuing a tradition I started in my early 20s rather than breaking from any tradition. Given its popularity and prominence in numerous guidebooks and on the Internet, I’d delayed a visit to this destination until I felt that circumstances were in my favor to have at least 24 hours of solitude at such a prime location. Between the Thanksgiving holiday, the frigid forecast (highs just below freezing, lows on either side of 10 degrees), and the short days of late November in the northern Rockies, I put my chips on those odds and planned the trip. It was five degrees when I loaded my car up and left Hamilton and the sun was shining on the snowcapped peaks of the Bitterroot Mountains as I began the two-hour drive to the trailhead. The drive was breathtaking and, given a recent snowstorm, the road conditions were surprisingly decent. Two feet of snow were present at the mountain pass as I crossed into Idaho and began the descent to the Lochsa River, which I would follow to the trailhead. As I lost elevation, the snow thinned out considerably and was patchy in the campground where I parked. 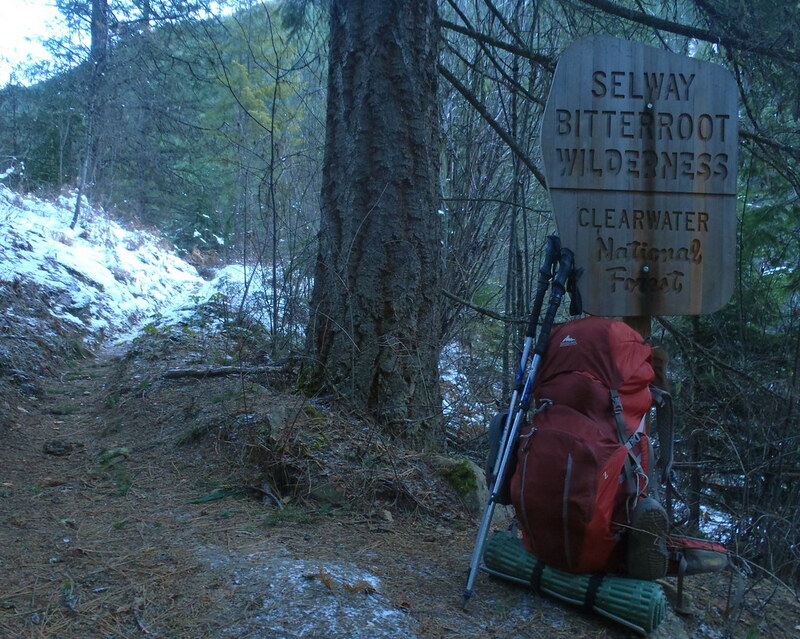 Shortly after 11 a.m., I shouldered my pack in the empty trailhead and headed up the trail. It felt like the temperatures were in the upper teens and there wasn’t a cloud in the sky. The trail started off with a steep climb that got my blood flowing and my zippers opening. It remained a gentle grade for the next few miles and I vented or zipped up according to my level of exertion, the amount of shade I was in, or the combination of the two. The views of the Boulder Creek drainage were scenic, but a but intimidating as I knew an unbridged creek crossing loomed ahead of me. I took a break at the wilderness boundary at two-miles then continued on to the crossing. Boulder Creek, true to its namesake, featured a streambed of uncountable boulders and rushing water. Ice crept in from each bank and surrounded the rocks, while a swift current pushed frigid water downstream via the path of least resistance. Crossing this creek would be the crux of the hike and I was determined to take my time and minimize the not-inconsequential risk of crossing a large stream in sub-freezing temperatures. First, I took a sip of water. Then I put traction devices on my shoes and ensured my trekking poles were adequately locked and extended. Finally, I shifted my pack and zipped up my jacket so that I was as comfortable as possible. Satisfied that I’d adjusted all the variable I had control over in my favor, I looked for the best place to cross. Despite the abundance of boulders, all were inconveniently spaced and covered with snow and ice. I spotted a downed tree a few hundred feet downstream that resembled a bridge and made my to it. Not wishing to tempt fate, I straddled the snow-covered log and scooted across. Although I was on solid ground after dismounting the log, there was still another channel of the creek to cross. Fortunately, this was a much smaller channel of the creek and I was able to walk across a downed log to the other side of the creek without incident. While the crossing had been as good as I could have hoped for, I had inadvertently ended up pretty far downstream from the trail. Fortunately, the forest wasn’t very thick, although it was boggy in spots, and I was able to easily work myself back towards the path. When I encountered a large downed tree, I joked to myself that “Well, trees usually fall across trails, so I might as well see where this one landed.” I couldn’t help but smile when I stepped off the tree and onto the trail. 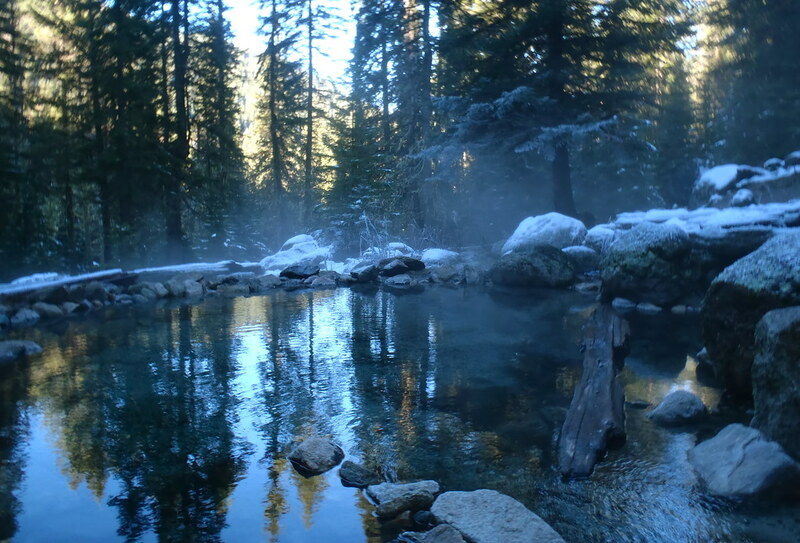 The last half-mile to the hot springs was bathed in the glorious and fleeting light of early afternoon in winter and was especially fragrant with spruce and pine. As the narrow footpath closed in on the hot springs, my anticipation increased. When I saw steam wafting through the forest I became almost ecstatic and knew I had arrived. I scoped out the springs and dipped my fingers in the warm water of the pool closest to the trail before embarking on the search for an ideal campsite. The campsite I found was excellent — a few hundred feet from the hot springs, above the main trail, no widowmakers nearby, it was hard to ask for more. 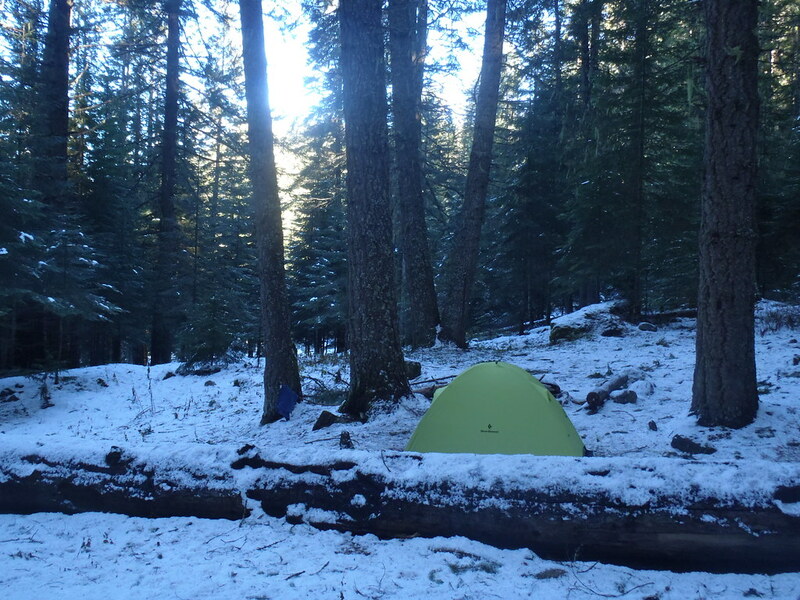 There was a heavy dusting of snow in the forest but the dense canopy cover allowed me to set my tent up on bare ground. After getting my campsite situated and hanging the bear line, I headed over to the hot springs. I won’t bother trying to describe in detail what it was like to ease into a steamy pool of water on a sunny winter afternoon in a lush mountain forest. Incredible is probably the most accurate word I could use. Perfect would also be suitable. The water temperature, the size of the pool, the frost clinging to everything within a few yards of the springs, the sound of the water as it flowed from pool to pool — there was no opportunity for improvement. I floated around for just over an hour with half of a 3/4 length foam sleeping pad allowing me to perch on various rocks and logs in utmost comfort, and supporting my lower back as I floated in the middle of the pool. A few sips of bourbon and reading “To Build a Fire” by Jacking London for the dozenth time or so made the time fly by. Just as the day began to darken I exited the pool and cooked my Thanksgiving dinner of pasta, spinach, mushrooms, tuna and grated cheese. Not quite a turkey dinner, but not half bad by any means. Once dinner was cleaned up, I took a thermos of hot chocolate back to the hot springs for a starlit soak. Words fail at communicating the bliss of the experience, so I’ll quit while I’m ahead. I soaked for maybe two hours before getting out, putting on a fresh wool baselayer, and heading to the tent. I was supremely relaxed but not exactly tired, so I read a bit more before turning off the tiny lantern that lit my small tent. I added a fleece pullover during the night, and a midweight set of wool bottoms in the early morning hours, but this was to be expected. My 15 degree bag was pushed a bit past its limit, which is why I’d brought my puffiest down jacket and thicker wool layers. When I exited the tent in the morning to retrieve the food bag it was about 8 degrees, according to the keyring thermometer I’d set on a branch near the tent. Not being in an hurry, I took the food bag back to the tent and climbed back into my sleeping bag, then sprawled out and made coffee and oatmeal just outside the tent. I had a liter bottle of water in my sleeping bag to keep it from freezing and another liter in a Platypus in a minor pool of the hot springs to keep it from freezing. I sipped coffee in the comfort of my sleeping bag, read some more Jack London, and made another round of coffee before finally leaving the tent and heading over the hot springs for a late morning soak. 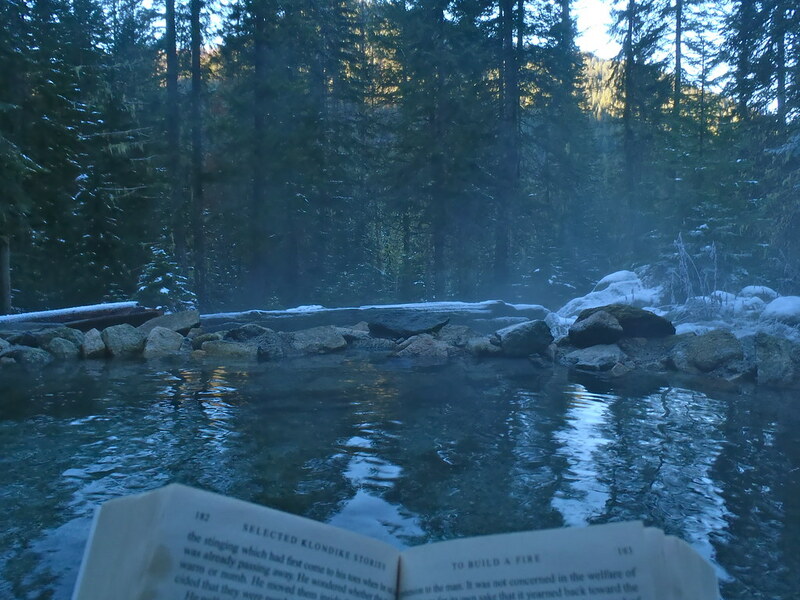 Starting the day with a cup of coffee and a soak in a hot spring in an idyllic setting while reading classic stories of adventure and peril in the Yukon is something I would highly recommend. Determined not to have a sedentary day, I decided to hike up the trail as far as I could to scout it out for a future trip. On the map, it seemed like a great loop hike could be put together. I ventured up the trail only a few hundred yards before it faded into fallen trees. I tried to push through in hopes the path would re-appear, but to no avail. It seemed to just fade out. I’m not trying to give myself too much credit, but I’ve followed some notoriously faint and/or rough trails in my time as a backpacker. Deep Creek Trail and North Fork Citico Creek Trail in the Joyce Kilmer-Slickrock Wilderness/Citico Creek Wilderness, a seldom-used mid-elevation path in the Chiricahua Mountains, and a decommissioned Forest Service trail to an unnamed lake in the Bitterroot Mountains immediately come to mind. But on this trail I wasn’t able to make much progress. 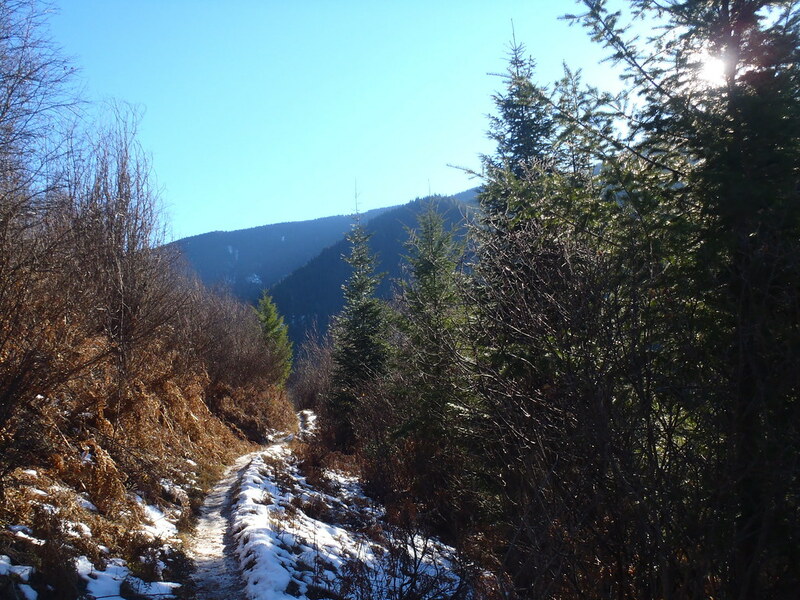 Maybe it was the downfall and dense vegetation, maybe it was the snow, or maybe it was the fact that there was a hot spring waiting for me, but I turned back after only a half-hour or so of forward progress. I did wander down to the creek during this outing to admire the beauty of the partially frozen stream for a moments, which was time well spent. Once back in camp I had — you guessed it — another soak before enjoying a delicious snake of cheese, pita chips, fruit strips, and jerky, along with a warming cup of mint tea. Shortly after I finished my feeding frenzy, two other backpackers arrived. These dudes reminded me of myself and my friends, which is meant as a compliment. They were great company and oddly enough had lived in east Tennessee earlier in their lives, which is where I was born. So we had some common ground (pun intended) in that we had each spent a good bit of time in Great Smoky Mountains National Park. While I valued my solitude, my assumption that any folks who would spend a frigid Thanksgiving weekend at a backcountry would probably be pretty good people was proved correct. I enjoyed another soak before dinner while getting to know my neighbors. Thai peanut noodles with chili-lime jerky and fresh-squeezed lime juice as on the menu, and I enjoyed an aperitif of Kentucky bourbon while my stove did its work. With a full stomach, I headed back to the hot spring to enjoy another night of stargazing. Seeing shooting stars from a hot spring is a great way to end a day, and the conversation with my springmates was interesting but not overwhelming. We all seemed to know how to appreciate silence, which unfortunately doesn’t seem to be a universal value these days. Zipped into my sleeping bag, I got another great night’s sleep and awoke to a morning just as chilly as the one that had preceded it. A cup of coffee made packing up bearable, as did the promise of one last soak before hitting the trail. I tried with my utmost to internalize the beauty around me as I slipped in for the last time. Steam rose and mixed with frigid air, depositing beautiful frost formations on rocks and logs; and on the living carpet of moss that grew from log to rock to ground and back. An impossibly beautiufl scene and one that was nearly impossible to leave. 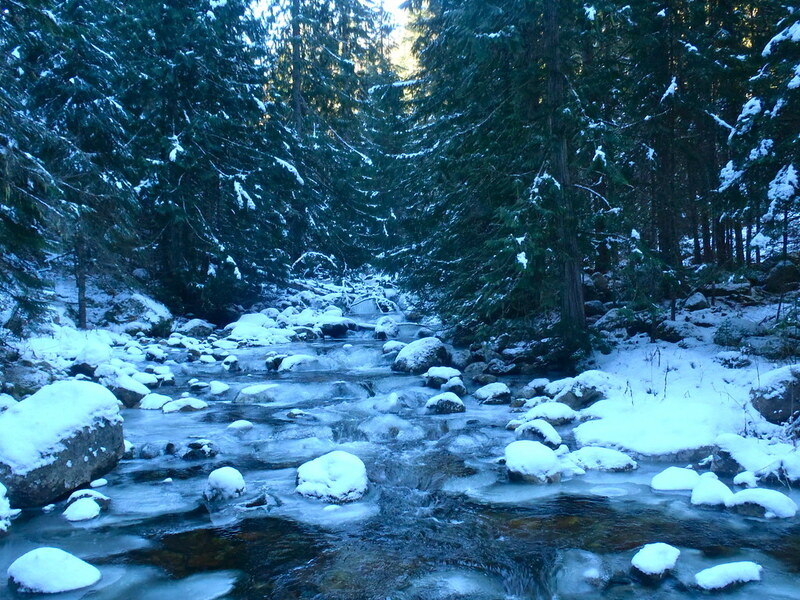 Nevertheless, after a final soak I headed down the trail with a feeling of rejuvenation and gratitude. 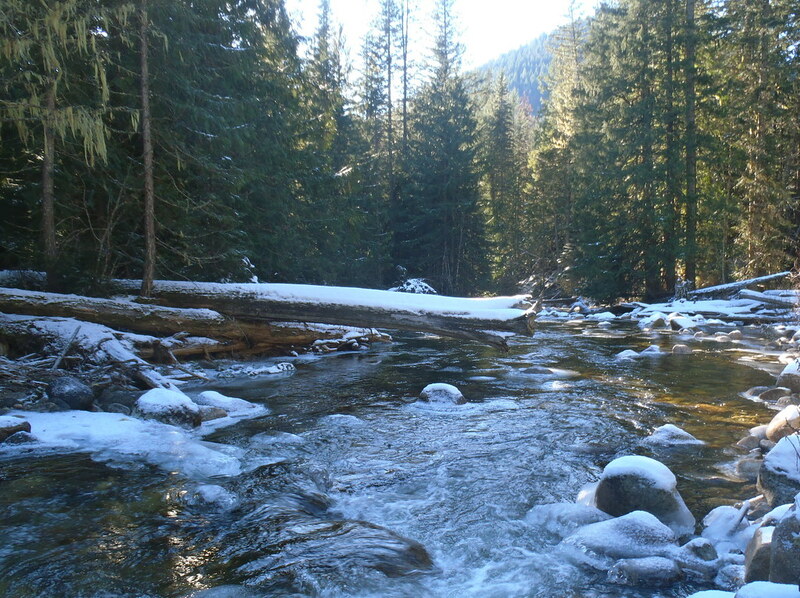 As accommodating as the hot spring had been, the crossing of Boulder Creek was the exact opposite. I took a different route than the one that I had used to cross a on my trip over and it was a slight improvement in both safety and convenience. Aside from the fact that I was moving further from the hot spring and my time in the woods was winding down, it was a great hike out. The slight downhill grade made for efficient hiking and the light pack (owing to food and fuel consumption) was noticed and appreciated. I made it back to the trailhead in the middle of a sunny afternoon. I changed into fresh clothes and made a cup of coffee for the road before hopping in my vehicle and beginning the gorgeous drive home. Despite radiating satisfaction on the return journey, I was just a bit disappointed to know that baths at home just wouldn’t feel the same after this trip.